Singapore’s Land Transport Authority (LTA) has announced the alignment and station locations for the Eastern Region Line, to be known as the Thomson-East Coast Line (TEL). 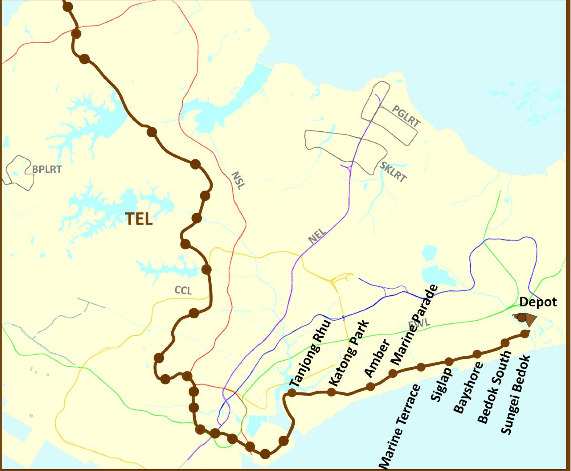 The 13km East Coast stretch of the TEL will run entrely underground and will connect commuters living in the eastern parts of Singapore not directly served by the rail network. As part of the 43km long TEL, the East Coast stretch will also connect commuters to the North-South corridor. This new stretch will have nine stations, including one interchange station with the Downtown Line (DTL). In all, TEL will have 31 stations, of which seven are interchanges. LTA has also finalised the alignment of the DTL3 Extension (DTL3e). This new extension will be 2.2km long and consists of two stations, including the interchange station with the East Coast stretch of TEL. It will improve public transport accessibility to the Changi Business Park and Expo areas. By linking the TEL and DTL, this extension also improves public transport connectivity in the eastern areas of Singapore, and helps relieve crowding on the East-West Line (EWL). LTA will also build Singapore’s first underground bicycle parks at MRT stations. Located at four of the stations along the East Coast stretch of the TEL, these bicycle parks will be useful for commuters who wish to cycle to the MRT stations from their home or workplace. The East Coast stretch of TEL will be completed in two stages. The first seven stations from Tanjong Rhu to Bayshore will be ready in 2023, while the remaining two stations, the DTL3e and the depot will be completed in 2024. When fully operational in 2024, the 31 stations on TEL are expected to serve about 500,000 commuters daily in the initial years, rising to one million commuters daily in the longer term. All efforts have been made to minimise land acquisition. Unfortunately, the Government will still need to acquire six landed properties along Amber Road and one three-storey walk-up apartment along Tanjong Katong Road for the development of the TEL. In addition, nine part lots will be acquired. The latest from the Tunneling Journal direct to your inbox.